Colours and variety are the key to anybeautiful smile. 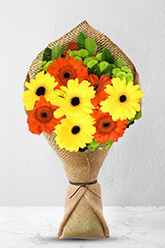 This bouquet has just thosepopping ingredients with bright orange andyellow Gerberas, accompany with interestinggreen button Chrysanthemums. Send thisbouquet to make someone smile.Vase is not included however; for a lastingimpression we recommend a Superior Vasewhich is the ideal selection for this gift. All went well. I loved your reminder service... something that would be absolutely amazing would be if you could take a photo of the flowers delivered and send it back to the customer... I never actually get to see the flowers I send. It would be nice! The email prompt is a great idea, making it very easy to mark a birthday for a relative in another city. I also appreciated the discount, and email confirming delivery.